I couldn't resist taking a photo of these gorgeous root vegetable chips before I devoured them. And that went fast, because they were absolutely delicious! Beets, parsnips, Blue Kongo potatoes and turnips.. all fried to crispness. I want more. These are bought, but I imagine they can't be too hard to make yourself, so I think I'll give it a go when I have some time to spend with my deep fryer! 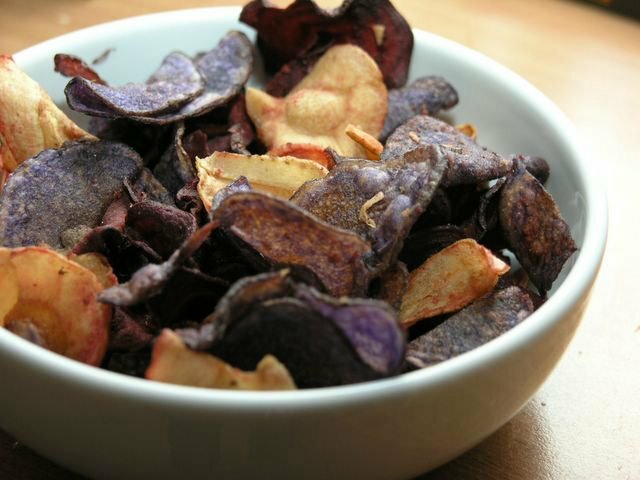 I want to grab those chips..I make tapioca and banana chips at home and they taste awesome.I havent tried with beets though.Got to try it. you can do it in your owen too! I once made it with celeriac. all you need to do is to slice celeriac (you can try it with parsnips, beets, carrots etc) as thin as possible and put them on a tray an cook at about 170 C degrees for let's say 10 min. it's tasty and a big surprise!